There’s blood in the water surrounding Google Search+ (what we’re now calling Google Search Plus Your World). The Electronic Privacy Information Center recommends the FTC look at Search+ for possible privacy or antitrust concerns. Meanwhile, Twitter’s General Counsel Alexander Macgillivray provides apparently damning evidence for why Search+ unfairly skews search results towards Google+ content instead of the most relevant results. 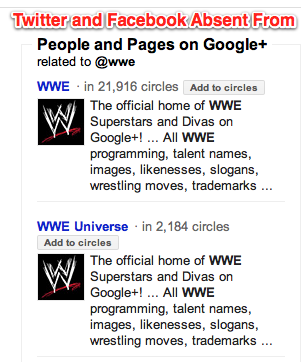 A search for World Wrestling Entertainment Twitter handle “@wwe” returns 5 Google+ results above the fold, but no sign of Twitter. But wait, Google Search doesn’t properly process symbols like ‘@’, so searches for “@wwe” and “wwe” produce the same results. Furthermore, if you haven’t received the Search+ rollout yet and try searching “@wwe” you get the same results as those with Search+ enabled, minus the Google+ People and Pages sidebar. So to be clear, the only thing that Macgillivray’s screenshot shows is that Search+ is just piling on an additional Google+ sidebar that doesn’t show Twitter or other relevant social network profiles. Oh, and that it’s ridiculous that Google Search doesn’t understand symbols. In this case, results aren’t being re-ranked to favor Google+. Still, EPIC’s Executive Director Marc Rotenberg tells the LA Times that regarding Search+, “We believe this is something that the FTC needs to look at”. EPIC is currently considering drafting a letter to the FTC. EPIC believes that by surfacing in search results the private content shared with a user by their friends, Search+ may violate privacy. I personally don’t buy that argument. Yes, it’s a bit shocking to see private content in Google Search results where we’ve come to expect only public content. However, private content isn’t exposed to anyone that couldn’t already see it, so I think EPIC is fear mongering around privacy. Last week I shot down a similar EPIC stunt claiming Facebook Timeline violates privacy. As Marketing Land’s Danny Sullivan explains, Google has sufficient data on Twitter and Facebook to show their profiles in its People and Pages sidebar. Only Google+ results appear there, though. Google Executive Chairman Eric Schmidt says Google is open to talking with Twitter and Facebook about expanded access to their data, even though it wouldn’t need it to make People and Pages more fair. Google makes for a great political football, so it’s not surprising that EPIC and Twitter are attacking. Their claims are over the top, though. The issue isn’t privacy, or primary search results for topics (though I take issue with the largely irrelevant Google+profiles appearing in the typeahead for name searches). The issue is that Google has the data to surface its competitors in People and Pages, but doesn’t. Hey, maybe this is all a clever ploy to bring antitrust scrutiny to Facebook’s deal with Microsoft’s Bing to sour its IPO. For a different view, check out TechCrunch’s Devin Coldewey’s article “A Google+ Tempest In A Teacup” about why Google isn’t obligated to include Twitter’s results in the People and Pages Juice Box.